Thanks to Saturday Night Live and a friend who urged Tracy Morgan to try earning a living out of making people laugh, Tracy is now famous as an American comedian and actor. The comedian had a very rough upbringing. Almost nothing was normal for him until he embraced comedy and it became his salvation, liberating him from poverty and a life of crime. Let’s start from his beginning; gradually, we will get to how he got to become who he now is – a super-rich and super-popular celebrity. Tracy Jamal Morgan was born on November 10, 1968, in the Bronx and raised in a housing project in Bedford Stuyvesant, Brooklyn. As common with most low-income neighborhoods, Tracy’s was crawling with drug dealers and gang violence was the norm. His father, Jimmy Morgan was a Vietnam war veteran whose return from war in 1974 should’ve gladdened the family considering that not many people made it back alive, however, the opposite was the case as Jimmy came along with way too much baggage – a chronic drug addiction. As a result of this, he left the family when Tracy was just a 6-year-old boy. Tracy continued to grow with his mom until his high school days at DeWitt Clinton when he moved in with his dad. Soon Jimmy Morgan was sober but had already contracted AIDS as a result of the needles he had used for drugs. Tracy, 17, who was in his second year dropped out of school in 1985 to cater for his ailing father and also married his high school sweetheart Sabina. Unfortunately, Jimmy Morgan died two years later in November 1987 aged 39. Tracy, with his hands full of responsibilities, turned to selling crack cocaine for livelihood, but only made a moderate success. He soon added road-side stand up comedy to increase his income. His best friend at the time was impressed by his skills and urged him to actively pursue a career in comedy. Unfortunately, he was shot dead during a gang raid. As a result, Tracy who was double-minded at first made the decision to pursue comedy in honour of his late friend. Tracy Morgan began doing stand up at the Apollo Center, Harlem and soon found success enough to get his family (his wife and three sons) a home in a better, less-violent Riverdale in the Bronx. He continued to achieve success at Uptown Comedy Club, Harlem and in 1994 he was selected to play the supporting role of “Hustle Man” in Martin Lawrence‘s TV show “Martin”. He stayed on the show until 1996, a year before it ended. Right after leaving “Martin”, Morgan got his major break as a cast on sketch comedy show Saturday Night Live. He remained on SNL from 1996 to 2003. In his final 8th season at SNL, he has already earned thousands of dollars per episode. Morgan continues to make surprise appearances on the show as host. Also during his SNL period, he landed roles in a number of feature films including “A Thin Line Between Love and Hate” (1996), “Half Baked” (1998), “Bamboozled” (2000), “30 Years to Life” (2001) and Chris Rock‘s “Head of State” (2003). After leaving SNL, Morgan launched his own show “The Tracy Morgan Show” in 2003. However, due to low ratings, it only aired for only one season. Things looked bright again when he was specifically selected by fellow ex SNL star Tina Fey to star as Tracy Jordan, a parody of himself in his hit sitcom “30 Rock”. In the first season which premiered in 2006, Morgan received $75,000 per episode which totalled $1.5 million for the first season. That paycheck grew exponentially to the peak of $2.2 million per season from its penultimate 6th season in 2012. That same year, he received $5 million for reprising his voice role of Luiz in “Rio 2”. While on “30 Rock”, Morgan also starred in a number of feature films like “First Sunday” (2008, Gr – $38 million), “Superhero Movie” (2008, Gr – $71 million), “Cop Out” (2010, Gr- $55.6 million), and “Death At a Funeral” (2010, Gr, $49.1 million). In addition to these, Tracy was also active in touring which grossed an average of $41,000 per stop and from that endeavour alone, he could’ve made an estimated $500,000 per year. His total asset is estimated at $18 million. Tracy Morgan Accident, Is He Dead? It is strange people wouldn’t stop asking if Tracy is dead since he was involved in a car crash in 2014. On the 7th day of June in the said year, Morgan alongside comedians Harris Stanton, James McNair and others were returning from a comedy tour in a Mercedes Sprinter minibus when they became involved in a fatal 6 vehicle crash initiated by a Walmart transport-truck driver Kevin Roper at New Jersey. The crash left Morgan’s partner and longtime friend James McNair, aged 62, dead while Morgan himself was brutally injured and flown via a chopper to a nearby hospital. Morgan spent 8 days in a coma and over a month in rehabilitation. Morgan filed a lawsuit against Walmart in July 2014 and received an undisclosed settlement fee in May 2015 which has not been added to his $18 million portfolios, so apparently, Morgan could be worth far more than that. While Morgan’s settlement fee remains concealed it is known that Walmart paid deceased McNair’s two children $10 million. 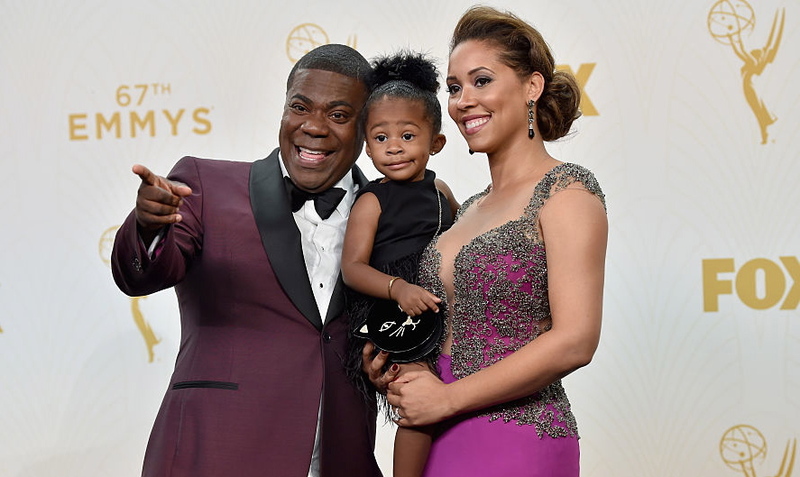 Tracy Morgan has recovered fully and is back to earning top dollar. In fact, his comedy tour “Tracy Morgan: Picking Up the Pieces” began in February 2016. A few months after the settlement, Morgan in August 2015, bought a 2-acre, 22-room mansion in Alpine, New Jersey for $14 million and married his longtime fiancee, model Megan Wollover with whom he has a daughter, Maven Sonae Morgan. Maven was born on 2nd July 2013. Maven isn’t Tracy’s only child. His union with his high school love, Sabina Morgan was blessed with three sons. Tracy Morgan Jr., Gitrid and Malcolm Morgan. The comedian divorced his first wife whom he was estranged for 8 years in 2009. Things have not been smooth between Tracy, his mother, Alicia Warden and other members of his family. Sometime in 2012, Alicia in a phone interview with CNN related that Tracy gave her only $2,000 out of the $25,000 she needed to settle her mortgage. Also, Asia Morgan, Tracy’s sister told the world that the comedian is a douchebag. In all, Alicia and Asia accused Tracy of being unwilling to help the woman who toiled to raise him, to keep her home from going into foreclosure. In response to the claims of his mother and sister, Tracy issued a statement which disclosed that he is estranged from his mother and haven’t seen her in 11 years. This was in 2012, it’s possible the family has found peace.